Weekend Picks Sept 30-Oct 2: Beer, Chili, and Chowder. And More Beer. We haven’t been keeping up with events the past month or so, but we’re back in action and so are the events this weekend. Fall starts off with a bang (and lots of beer) this weekend. 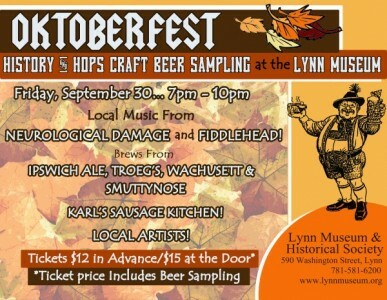 Start things off right with the Lynn Museum’s Oktoberfest Celebration tonight from 7:00 to 10:00. They’ll have brews from local faves Cape Ann Brewing and Ipswich Ale and others, along with treats from Karl’s Sausage Kitchen and live music. Tickets are $12 in advance, $15 at the door. 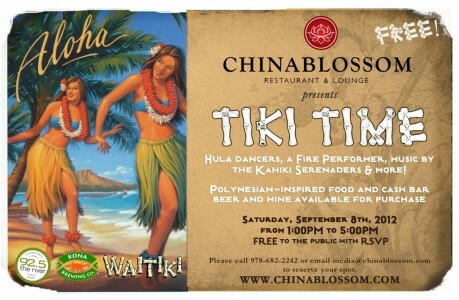 Speaking of beer, we are smack dab in the middle of North Shore Beer Week. You may recall last year we interviewed the 2 Beer Guys about the development of NSBW. They are back again this year with even more events. Check out the schedule here for craft beer tasting all over the North Shore. In Salem, Beer Week means the second annual Witchtoberfest , which this year includes a run to benefit the Boys and Girls Club as well as a beer garden featuring local brews and live music. If you’re looking for something hearty and warm as the weather starts to cool off, on Saturday you can choose between chili and chowder. If spice is your thing, head up to Newburyport where the Grog will be holding its fourth annual Chili Con Carnival, a chili cook-off to benefit three area food pantries. 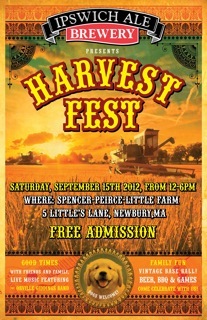 The entry fee is $10 to sample the chilis and delectable cider doughnuts from Cider Hill Farm. Ipswich Ales will be on hand selling beer. If chowder is more your style, then Ipswich is your Saturday destination, where the Lion’s Club hosts its annual Chowderfest. For $10 you’ll get to try chowder by various local restaurants, including Windward Grille, which won the people’s choice award for chowder at last year’s Essex Clamfest. 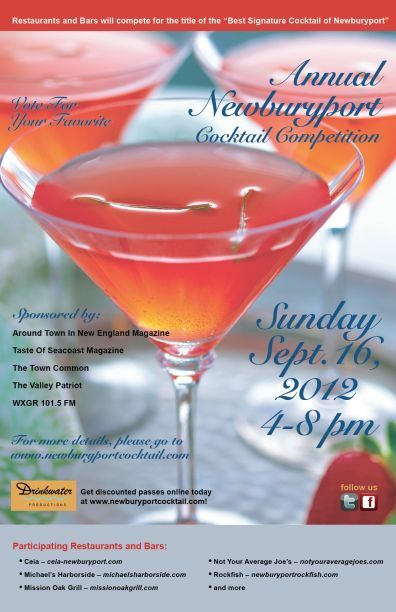 We are also pleased to see 5 Corners Kitchen will be on hand. North Shore denizens have been missing Chef Barry Edelman’s tasty fare as his Marblehead restaurant is undergoing repair from a fire earlier this year. Both events run from noon to 3:00, so if you’re really hungry and want to take a scenic afternoon drive, you could have your fill of each. If the weather holds, a stop at Cider Hill for apples or DownRiver for ice cream would complete the day. Autumn on the North Shore just doesn’t get any better.